Before you start, make sure you have covered the basics from our blog post Pressure Cooker 101. 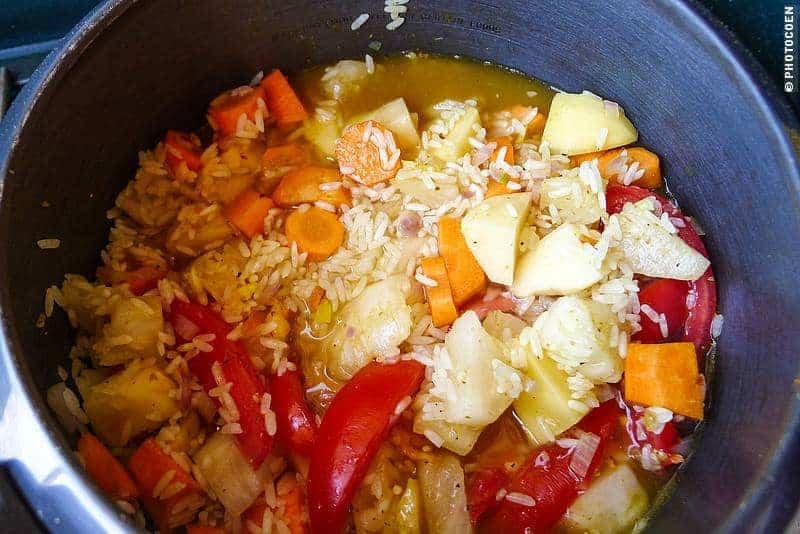 Here is our first recipe: rice with vegetables in the pressure cooker. If you have questions, post them below in the comment section and we’ll answer them as soon as possible. 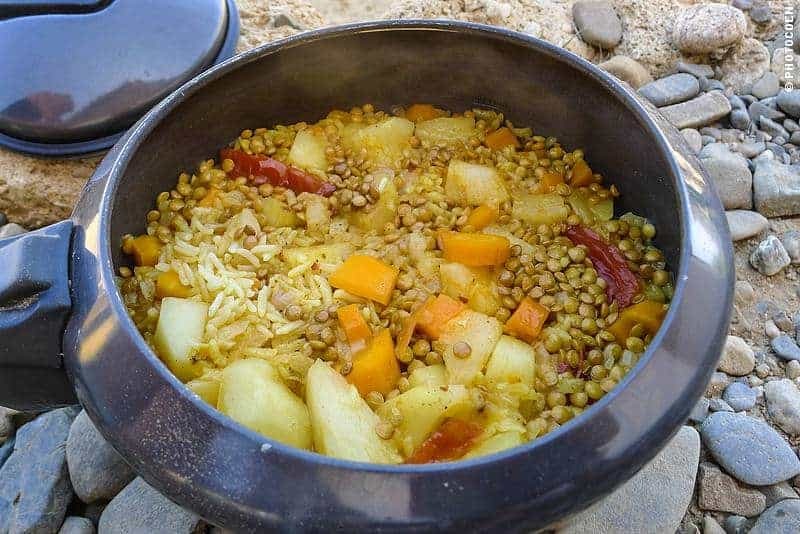 For a long time this meal has been our favorite when cooking our own meal in the Land Cruiser. It also is our quickest meal to prepare. 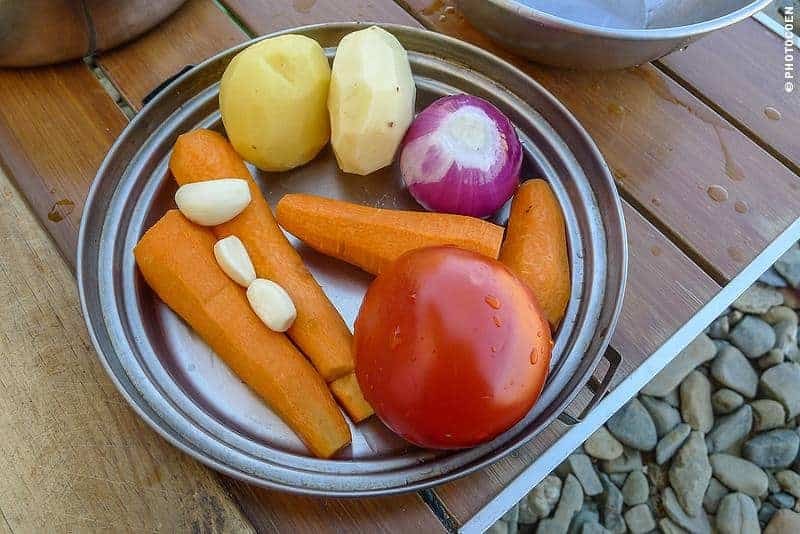 Plus, it is super convenient as all ingredients are easy to keep for a longer period of time, which is great when you plan (or end up) rough camping for a couple of days. You put everything in the pressure cooker with water and spices. You close the lid and cook the food for 5 minutes as soon as the pressure is on (steam coming from the steam vent), which you can do on low heat (make sure the pan keeps producing steam). Turn the heat off, let it stand for another 5 minutes with the lid on, release pressure and enjoy your meal. Cut whatever vegetables you have: tomatoes do very well, as do carrots, potato, sweet potato, etc, or add a small can of corn. Tomatoes really add to the taste of the dish. I like to add some fruit as well, e.g. pineapple or raisins, so I cut a pineapple in pieces or let raisins soak in a cup of water. 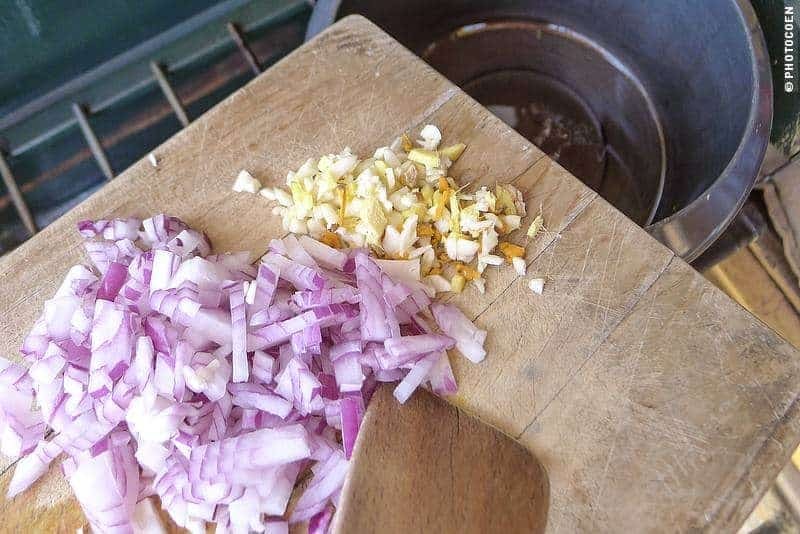 Fry an onion, some garlic, maybe some ginger and turmeric in a teaspoon of oil or a bit of water. Add rice (we use one cup for the two of us) and fry that too for about 1 minute. Add the vegetables, fruit, lentils or tuna. Add water (general rule: for 1 cup of rice we add 1,5 cups of water plus for 0,5 cup of lentils we calculate a small cup of water). 1. 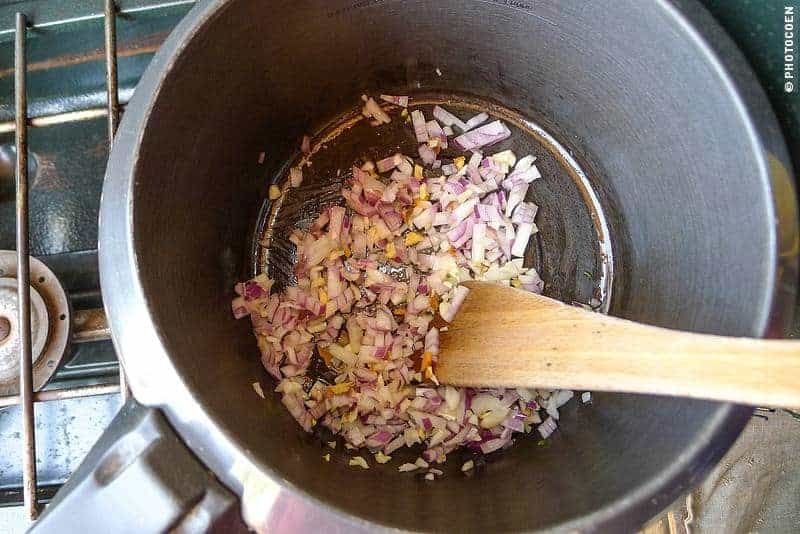 Fry onion, garlic (ginger, turmeric & other spices). 2. Add rice & lentils and fry a bit. 4. Add vegetables and fruit and more water if necessary. Remember to adjust the amount of water depending on what and how many fruits or vegetables you’ve used. If you have a lot of water-rich foods (like tomato and pineapple) you need less water. It’s a matter of experimenting a bit. The reason to use white or parboiled rice is that brown rice needs a longer cooking time (about 8-15 minutes). 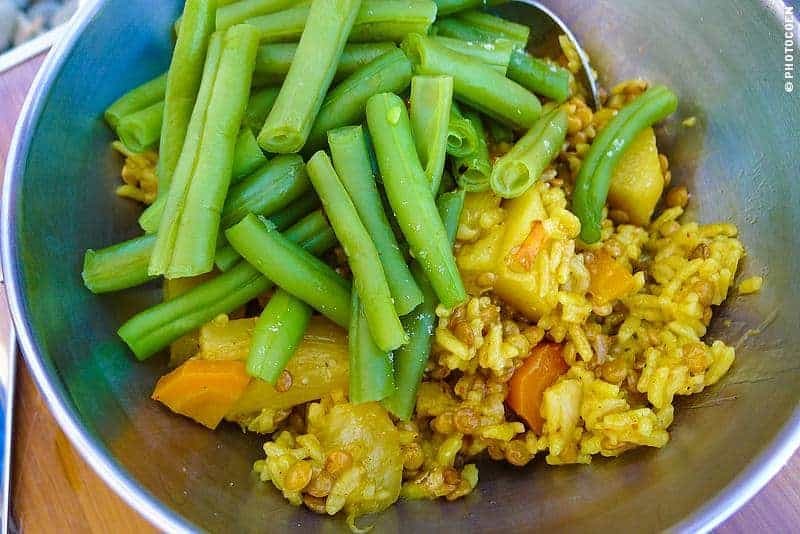 Cooking this dish with brown rice will cook the vegetables soggy instead of between crunchy and soft. I do cook brown rice at times, but then I prepare the veggies separately. We’ll get to that in future recipes. Like I said, we like to add raisins or pineapple. However, vegetables that get too soggy for this recipe (I find) are green beans, broccoli, and cauliflower. Coen closes his eyes and takes five little containers from the herbs & spices box and adds those to the dish. So we never know beforehand what the result will be, which keeps it interesting. 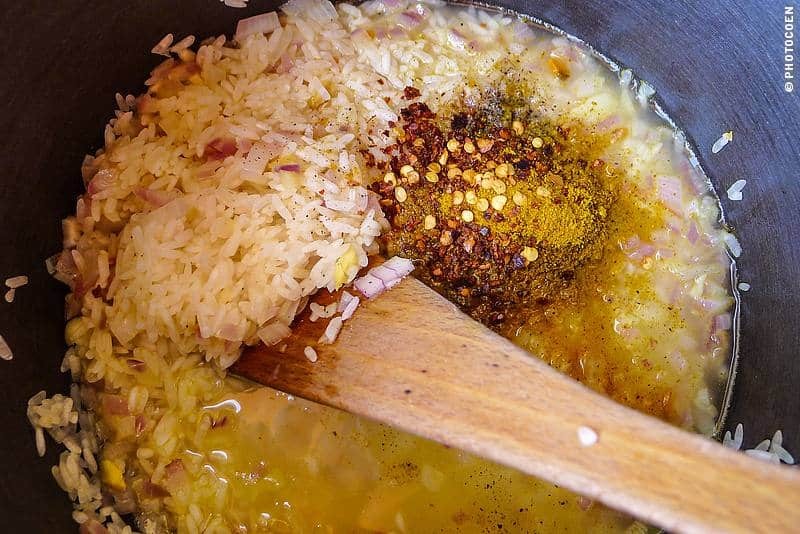 Having said that, some of our favorites for this dish are curry, coriander (seeds), cumin and 5 spices. You don’t need oil; frying in water works fine. But some rice tends to froth a lot and oil somehow prevents it from doing that so that’s why we use it. In our meat-eating days we always had a couple of cans of tuna in stock. Of course, you can use any other kind of canned fish or canned chicken. Nowadays I add lentils. In this case I steamed some green beans beforehand (adding them with the rest will make them soggy). We hope you like it and that your dish turns out just fine. Will you let us know in the comment section below? Also consider adding leaves – we found spinach works well with rice in the pressure cooker. Will try beetroot leaves next, just waiting for the beetroot to stop growing so that we can dig them up! I think we bought the wrong size pan though. We got the 1.5L size, which is great from a storage point of view, but we are starting to find it quite restrictive when cooking. What size are you using? Thanks for the tip, we’ll give that a try as well. Thus far we generally have eaten leaves as a salad. Our pressure cooker is a 3 liter size, which we think is a good size. E.g. when making a meal like this we have in fact two meals. Sometime I’ll use the leftovers to make a fried rice dish or a salad – more on that in a future post. Coen chimes in: the 3-liter is the biggest size Hawkins Pressure Cooker with just 1 handle. Bigger sizes have a second handle and then we think it really becomes to bulky for in a car (like ours). Thanks for the reply. Storage is a big issue for us (little cupboards in a Westfalia), I think we need to try and borrow one and see what fits, but it would be great to be able to try some of the more interesting recipes. I would say that 1.5 liters should be enough for most 2-person meals though. You could always half the ingredients, e.g. for Indian curries, which are often recipes for larger quantities. What kind of recipe do you feel doesn’t work in your pressure cooker? It’s the bulky things that cause the issues. Potatoes for instance. It doesn’t take much to fill the pan, in reality it’s around 1 litre capacity, leaving space for the steam. Like yourselves we like to cook for more than one meal and turn it into something else the next day. One issue we have had, twice with rice – it never reached pressure and we ended up burning the rice. 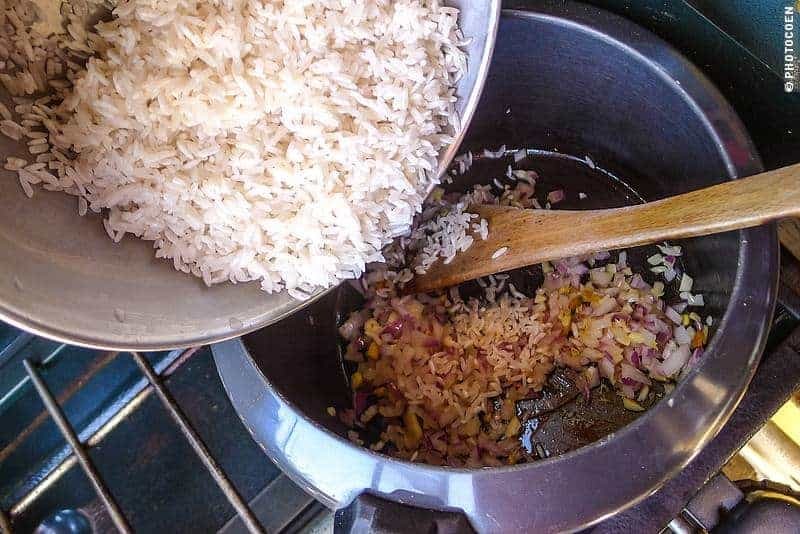 We’ve cooked rice plenty of times successfully, so not sure what went wrong on these occasions, always the same measurements of rice/water – has this ever happened to you? Any idea what the problem might be? did steam escape in one way or another? Was the seal clean of little grains of rice? Was the seal seated properly, e.g. not upside down? Other than that, I have no idea why that would happen? I do however make sure everything in boiling before closing either the lid or the valve. Betty, I know already replied to your comment but here are my thoughts. What I do to use the maximum space of the pressure cooker is cutting the vegetables small so more will fit in the pan. E.g. with regular cooking you might cut a potato into 4 pieces; now I cut it in 8 or 12. – I forgot to add the water! This cost us a safety valve. – The seal, or the edge of the pan to which the seal closes, has a bit of dirt on it so the seal doesn’t close properly and air escapes there instead of pressure building up. Thanks for your replies. we’ll double check the seal in future as I think that is going to be the most likely cause. Thanks for the cooking tips, will try them out. Finally gave up with the 1.5L pressure cooker, too many failures, too restrictive and eventually had to replace the safety valve too 🙂 We switched to a 3L sized cooker and what a revelation that has been – so much easier to cook in and no failures yet, just delicious meals. Only downside is storing it, but we knew that and it just about fits in the cupboard. Now looking forward to the winter soup season, yum! Still enjoying your blog. The recent ‘trusting’ post was great.